During the course of my study, I said am going to put all i could to know what this keywords of a thing is all about. I searched for quite some time, but was so happy for the eventual result I got. Though it wasn’t the actual information i needed, but it’s also not different from the keywords I was looking for, but I think you guys will really love to see this. Fine, any blogger you see and he/she is ignorant of what we called keywords, such blogger should just go and close his/her business. Anyway am only kidding. We always stand the chance of learning every day, and that is the more reason why you are reading this blog today. And for those who do not know what are keywords? Below are the few definitions i can cap on it. I thinks I have got several definitions here, but I’ll just like to take the one that it’s more clear and concise. Keywords can be define as an index entry that identifies specific records or document.–gistmode. A word used by a search engines in its search for relevant web pages– webopedia . Mere looking at the above definitions, I think I don’t have to stress myself in telling you that keyword have a part to play in you getting to page one of Google search, your traffic and automatically increase in clicks. We all know that Google AdSense is a pay per click program that you are only paid when people clicked the ads place on your blog. So the amount of money you are paid varies on the content you have on your blog and also in relation to your keywords. Smiles, you see what am saying now? For any blogger to make money with Google AdSense, you need to do a lot of keyword research and AdSense optimization. And which I have brought to your door step. 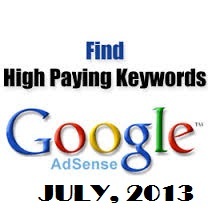 Though there are a lot of online books that can help you with the optimization and keyword research, but by not stressing yourself, I have brought to you the high paying Google AdSense keywords for July, 2013. I think I deserve a round of applaud. So, better start writing materials or article on each of the keywords related to your niche. Therefore, below are the high paying Google AdSense keywords.